A higher level of quality and efficiency create higher demands on medical personnel and equipment. In spite of new technology, some work still overwhelms today’s medical personnel. Remeda’s products provide simpler and more effective solutions for work in operating theatres and central sterilization departments. The Remeda instrument tables are specially developed to simplify work in the operating theatre. 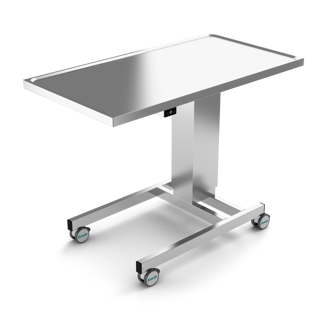 Height adjustment can be carried out without moving the table away from the operating table. The height adjustment is performed through a low voltage, enclosed motor/ battery system. The tabletop is constructed from stainless steel with raised edges on the working surface. The base and pillar are constructed from stainless steel. Maintenance is virtually unnecessary, and the unit will merely require weekly recharging. 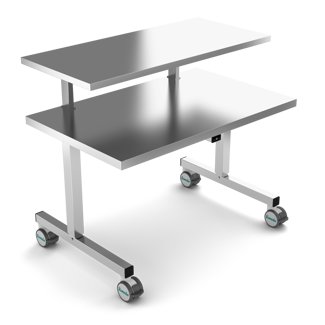 The instrument and mayo tables are available with a variety of sizes and functions. The Remeda theatre mayo tables are specially developed to simplify work in the operating theatre. 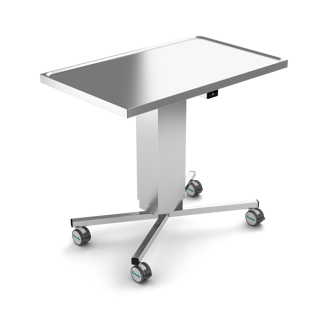 The height of the table can easily be adjusted by pressing buttons situated under the tabletop. 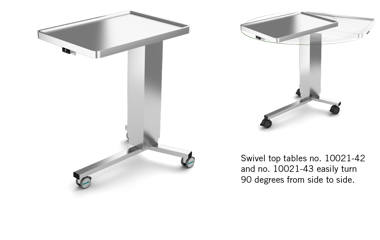 The table can be operated when the sterile drape is in position, without compromising sterility. On reference number 10021-42 and 10021-43 it is possible to turn the tabletop 90 degrees to each side. The tabletops are constructed from stainless steel with raised edges on the working surface. The base and pillar are constructed from stainless steel. The table is equipped with three antistatic castors. 10022 has the same features as the 10020 table, plus it can be used both as an instrument table and a mayo table. The tabletop is larger than on a mayo table and can support more weight. Because of the four wheels it also becomes more stable than a mayo table when weight is applied. The buttons are situated under the tabletop and can be configured to be on the side of the table or in the front of the table. The 10023 table has the same features as the 10020 table except that the pillar is moved to the back of the tabletop. Because of this, it is possible to move the table over the operating table to reach the items when standing on the other side, just like with a mayo table. The special shape of the chassis of the table also makes it possible to stack the tables under each other to save space when not in use. This is an appreciated feature when working in preparation rooms where the space is limited. 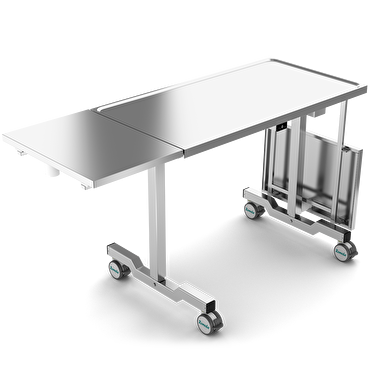 The 10024 table can support a higher weight than normal instrument tables and is, because of that, better suited for larger surgeries, for example those found in orthopedics. The height adjustment is performed through a low voltage, enclosed motor / battery system. 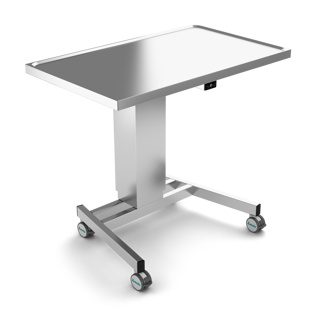 Remeda folding table are specially developed to simplify work in the operating theatre and if necessary create more work space. Maximum load on the table is 80 kg and for the folding side tables the weight capacity is 15 kg each. The Remeda 2 tier theatre instrument / back table are specially developed to simplify work in the operating theatre. It has the capacity to accommodate more cases then a normal instrument table thanks to the additional shelf. It is 300 mm between the two shelves. The table is also available with a lower shelf. The Remeda arm table is specially developed and suited for shoulder operations. 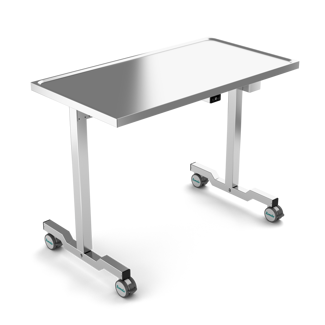 The electrical height adjustment is located on the foot of the table making it possible for the surgeon to operate the table during surgery. The arm table remains stable during the operation due to the arm tables three feet. Because of the two wheels, the arm table can easily be rolled away when not in use. The arm table has no permanent connection to an external outlet. The battery pack, the electronics and the lifting device are installed in the pillar. A battery charger comes with the arm table, and it only needs to be recharged once a week, due to the generous capacity of the battery. 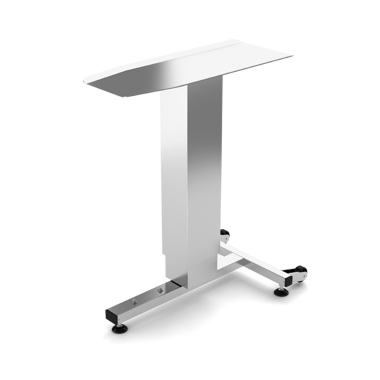 The top, pillar cover, pillar and stand of the arm board are all made of stainless steel. We also develop special instrument tables adapted to the customers need. It can be that the tabletop of the table need to be in special size or shape with features such as rails. The height of the table can also be adjusted to fit the usage of the table better. 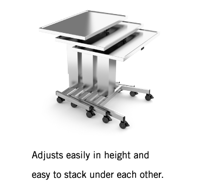 All tables are made with stainless steel tabletop and lifting column.